The Yuba triathlon will always have a special place in my heart since it was my first tri. A few years later, it still holds up as a good race now that I’ve done it a few times. (Except for the year I was recovering from food poisoning. That’s a race I block out). Put on by Racetri every September, it’s a great end to the summer. Yuba isn’t quite as packed as some of the other races can be. You don’t feel as though you’re running in a herd. It’s a state park so there’s a great campsite with showers and shade. I love any race where I don’t have to drive up in the morning. Also if the campsite fills up, there’s plenty of camping on the beach. Fairly flat bike ride. And the Olympic distance is one giant loop (watch for cows, however). The run is an out and back for both Olympic and sprint distances. 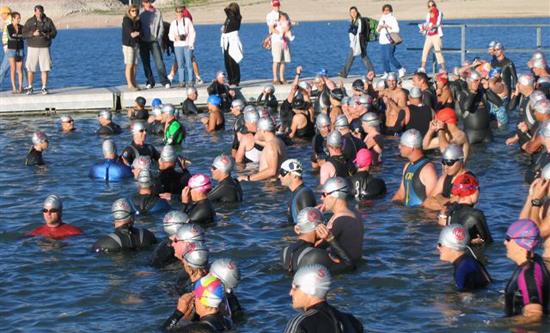 A huge variety of competitors make a good race for beginners and challenging for the more experienced. Yuba isn’t exactly near anyplace so no matter where you’re from, you’re driving in. Transition areas are not assigned. I can’t stress how nice that is. Yuba Reservoir can be a tad murky and green. The bike race goes along a road with graveled sides and it’s hard to tell where the road ends and the gravel begins. Many a racer has torn themselves up making the turn around. The run goes straight up the side of a hill on a dirt road—a dirt road with ruts and lots of rocks.